Airtec tubes are a convenient and simple system for testing possible contaminants in a gas cylinder, compressed breathing air and air lines for EN12021 regulations. Airtec tubes are available for monitoring Carbon Monoxide (CO), Carbon Dioxide (CO2), Oil Mist, Nitrogen Dioxides (NO2) and Water Vapour (H2O). There are 10 tubes per pack. 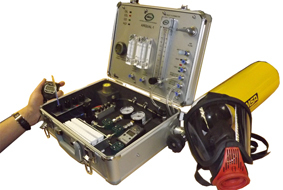 Airtec tubes do not require a sampling pump but rather work in conjunction with a breathing air quality test kit.